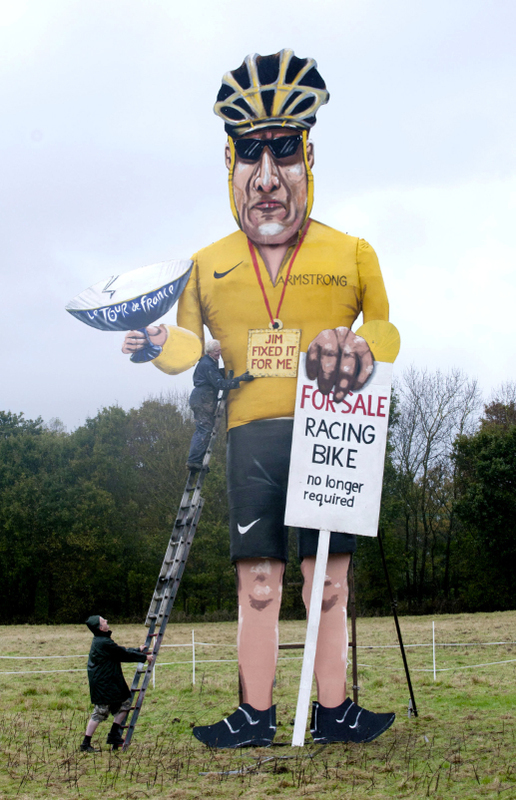 A giant effigy of Lance Armstrong will be burned in Edenbridge, Kent on Saturday as part November 5 bonfire night celebrations. The Edenbridge Bonfire Society selected Armstrong in the wake of a damning U.S. Anti-Doping Agency report that saw the American stripped of his seven Tour de France titles. The 31ft, steel-frame structure shows a caricature of Armstrong holding a poster that reads, “For sale, racing bike, no longer required” as well as a necklace reading “Jim fixed it for me”, which is a reference to disgraced television identity Jimmy Savile. “We had a shortlist which included Jimmy Savile but it was decided it would not be nice to use him as a lot of children attend the bonfire and they might start asking their parents questions,” Society co-ordinator Charles Laver told The Telegraph. “Then we had George Osborne but he hasn’t really got a face that everyone knows and he’s just a chap in a suit. We felt he would be a bit boring. “We started to do Abu Hamza but then we decided we weren’t entirely happy to do him, so Lance Armstrong came out of the woodwork.